Retroband is proud to announce release details for the latest version of his hugely popular MEATS vinyl figure, the “One Eyed, One Horned, Purple People Eaters” edition! Designed/sculpted by Retroband and produced by Unbox Industries, the 12″ tall figure has been cast in a purple soft vinyl, coming complete with subtle VColor sprays, custom resin arm attachment and eye. Limited to a run of just 25 pieces priced at $250 each, interested parties looking to bag the beast are going to need to fill out the dedicated lottery form here (click on the LOTTO tab) between 12pm CST today (3/26) and 12pm CST tomorrow (3/27). Winners will be notified within 24 hours of close… Good luck to all who enter! 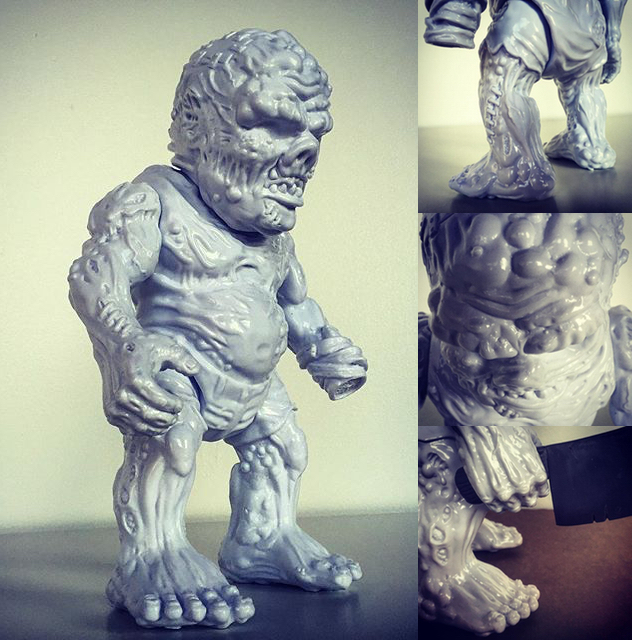 Having had success with their officially licensed “Zombo” action figure earlier in the year, the guys behind Unbox Industries have once again called upon the talents of Retroband, this time for the release of all-new soft vinyl creation, Meats! A loving tribute to both classic zombie and body horror flicks, the decaying, deformed creep appears to stand at a round 12″ tall, featuring articulation in the arms, legs and neck as well as coming with both cleaver and meat hook accessories. Revealed at Mondo Con over the weekend in an unpainted grey vinyl, we’re told to expect the first release as soon as DCon next month… Look out for more news as soon as we hear anything!